The EIROforum information stand at ICRI 2012 As in the past ECRI conferences, organised by previous EU Presidencies, EIROforum and its member organisations were also represented at the ICRI Conference in Copenhagen from 21-23 March 2012. 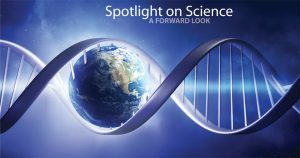 Among the invited speakers from EIROforum organisations were Dr Janet Thornton, Director of EMBL-EBI and Sergio Bertolucci, Director for Research and Computing at CERN. 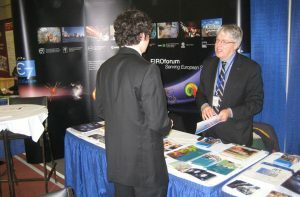 EIROforum also had an information stand and some thematic working groups have side-meetings in connection with the conferences. ESI 2017 The 5th EIROforum School on Instrumentation (ESI 2017) will take place from 19-23 June 2017 and will be hosted by the European XFEL. 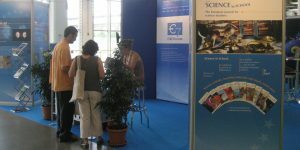 ESI, organised by the EIROforum Instrumentation Working Group, aims at teaching basic principles of instrumentation to young researchers, scientists and engineers. The highlight topic of ESI 2017 is Gravitational Waves. The school sessions will be held on the DESY site in Hamburg.